7 Fascinating Kingkiller Chronicle Theories (2019) | Nerd Much? With the discussion of Patrick Rothfuss’s Kingkiller Chronicle being a prologue resurfacing recently, let’s take a dive into some of the most interesting theories surrounding the elusive third book and the series in general. What happens when a massively popular fantasy series goes seven years without a new book? Theories, like blooming gardens (or festering wounds), begin to appear. Theories of all varieties and angles. 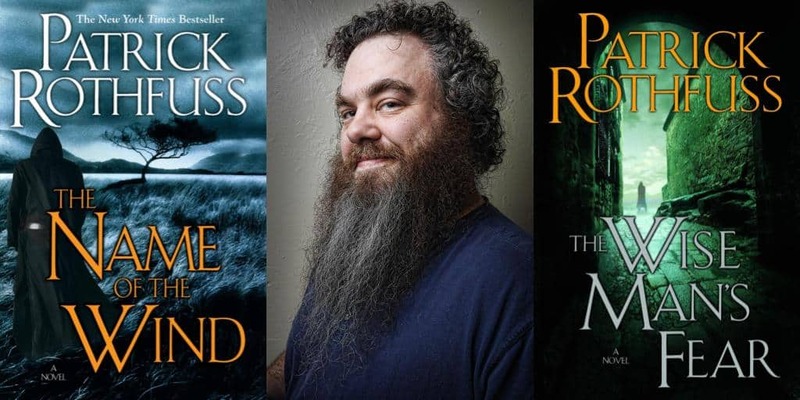 Patrick Rothfuss’s Kingkiller Chronicle thus far includes The Name of the Wind and its sequel The Wise Man’s Fear (and a novella, The Slow Regard of Silent Things). It’s filled with hints and breadcrumb trails about things to come. There’s plenty to speculate about, but at this point, the avid fanbase has probably predicted every possible outcome for the third and final book, Doors of Stone. We know that Bast is a Fae, and he’s been referred to as “Prince of Twilight.” Felurian’s title “Lady of Twilight” is enough to suggest a connection between them. At one point, I was convinced that Bast was Kvothe’s son (hence the name “Reshi,” which I assumed meant “father). We know that Bast’s father is someone called “Remmen.” But the Rothfuss-endorsed Pairs deck of Faen cards indicates that Remmen is an individual distinct from Kvothe. That doesn’t totally rule out this theory, but it doesn’t help it any either. This theory was created by /u/reasonb4belief, and it holds up well. Count Threpe is in a very advantageous position to have Kvothe killed when he finds him a ship to Tarbean. And who would pay Threpe to kill Kvothe? Ambrose, of course. Kvothe notes a suspicious-looking sailor on the docks before he board the ship. When he’s on his way to board, Threpe stops him to talk even though the captain is about to set sail. Only after the suspicious sailor boards does Threpe let Kvothe go. Kvothe’s ship is later shipwrecked, and Kvothe learns later that Threpe was keeping track of his journey (which he no doubt would have done if he were sincerely helping Kvothe, but it still stands out). My only reservation with this theory is that Kote is telling this story — why would he include all of these details about the suspicious sailor and tell this part of his tale so nonchalantly? Kote is a master storyteller, so maybe he’s planning on a dramatic reveal of Threpe’s treachery later on, but it’s worth remembering the context in which we’re told this story. This is further confirmed when /u/phyrog points out that the German translation of this line reads “Trotz ihrer Fehler ist es so, dass Ich nie im Leben In meinem Streben Zu lieben locker lass.” And this translation bends the English a bit to get “locker lass,” emphasizing the significance of this line. Whether “Not a tally a lot less” sounds like “Netalia Lackless” is up to you, but I think this all but confirms this theory about Kvothe’s Mother. You can find more of /u/phyrog’s speculation in the original post. The main support for this popular theory is that Bredon’s absences from Severan align with those of Denna, and therefore Master Ash, Denna’s Patron. When Kvothe visits the Cthaeh in WMF, he is told that Denna’s patron beats her: “Not all the time, but often. Sometimes in a temper, but mostly it’s a game to him.” A game, like Bredon’s beautiful games of Tak. Master Ash’s larger significance isn’t known, but revealing him to be Bredon — and Cinder — would be very Cinder-like. There is little we know about Bredon and his ongoings, but we do know he has a walking stick, like the walking stick that the Cthaeh claims Master Ash uses to beat Denna. This theory is contingent on the theory that Kvothe’s mother is Natalia Lackless. If Kvothe is the son of Iax, the master shaper, this would explain lots of his unusual skills. There are other clues throughout the songs sung about Lady Lackless — that she has a secret, and that a flood is held behind a certain door. Felurian has hinted that Iax is held behind the Doors of Stone, also known as the Lackless doors. So Lady Lackless (who may be Kvothe’s Mother, Laurian) may have gone through the Lackless doors and may have had a child with Iax and may have kept that secret with her until her grave. Possible? Maybe. Kvothe being the son of a legendary shaper isn’t a far-fetched idea, but it’s not a watertight theory. This is a theory that’s been floating around for a while, but /u/qoou really breaks it down on the /r/KingkillerChronicle subreddit. First off, Auri is a character surrounded by mystery. At the beginning of The Wise Man’s Fear, Kote claims to know “the truth about Princess Ariel.” Auri and Ariel sound pretty similar, for one thing. /u/qoou outlines the princess-like language used to describe Auri’s mannerisms, such as “She poured the beer so solemnly you’d think she was having tea with the king.” In The Slow Regard of Silent Things, we learn that Auri is the princess of the Underthing, collecting various “treasures.” All of this is not only a sign of her disturbed nature but also her former life as the princess Ariel. All of this sets Auri up to be the princess “stolen back from sleeping barrow kings” — this is presuming that Ariel is Tabetha (the name that princess Ariel may have taken when she went to the University), who we know claimed to be engaged to Ambrose Jakis (heir to the Vintic throne). This theory hinges on a lot of “ifs,” but /u/qoou’s linguistic analysis of character names and parallels to myths like Jason and the Argonauts it thorough and fits well. I don’t know if Rothfuss would base a major reveal on several subtle references to Biblical names and Greek myths, but who knows. This is my favorite theory for many reasons. Stay with me here. To start, Kvothe is dead. That’s how this whole story ends. Kote doesn’t remember being Denna, and when Bast asks the Chronicler to bring Kvothe back, he’s really talking about Denna. This makes it clear why everyone believes Kvothe to be dead — because he is. Kote can never become Kvothe again, because he lacks Kvothe’s skills, knowledge, and experiences. Kote has a self-loathing that we don’t really see in Kvothe, but that we see plenty in Denna. And maybe Kvothe’s betrayal of Denna is the reason for Kote’s dislike of himself. Kvothe’s story ends with his death, and Denna’s story continues when she changes her name once again, this time to Kote. This theory highlights all of the parts of Kote that don’t align with Kvothe — his refusal to play the lute, and his inability to open the Loeclos Box. All of these theories are to be taken with a grain of salt, of course. Most are fairly contrived — I don’t know if Rothfuss plans on explaining the Greek origins of character names. There’s a danger with speculation, particularly with fanbases that have been dissecting a series for years — when Doors of Stone is finally released, many people will be disappointed and possibly angered when their expectations aren’t met. I’m in it for the ride, whatever happens. Personally, I’m hoping Kote concludes his story partway through book three and we get to see a present-day adventure with Kote, Bast, and the Chronicler. Whatever happens in Doors of Stone, we’ll have some of our questions answered. And, no doubt, readers will still be speculating theories years later.